Former CIA Director Michael Hayden called the missile strikes carried out by the United States against a Syria government airfield "a remarkable flip" from the policies US President Donald Trump spoke about during the presidential campaign. WASHINGTON (Sputnik) — The missile strikes carried out by the United States against a Syria government airfield last week marked a major departure from the policies US President Donald Trump spoke about during the presidential campaign, former CIA Director Michael Hayden said in an interview on Monday. "What’s really remarkable is that [it’s] about as far away from ‘America first’ as you can get," Hayden stated on CNN. "That’s America doing something unilaterally for what I call the good of the order, rather than a narrowly-defined American self-interest. It was a remarkable flip from the man we saw in the campaign." In 2013, Trump warned former President Barack Obama against military intervention in Syria. 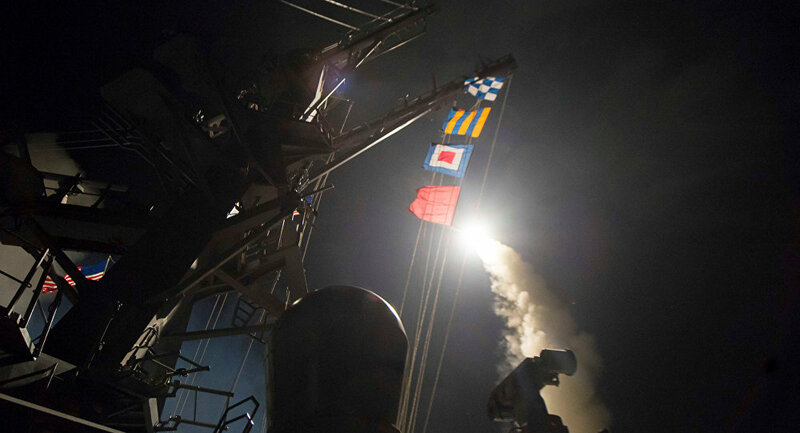 On April 7, the US fired 59 tomahawk cruise missiles at Shayrat Air Base near the city of Homs in response to a chemical weapons attack against Syrian civilians.